The Beginning - World War II - This page tells the story of the beginning of Turner Field - and starts World War II history in Albany, Georgia. For more detailed information on stories mentioned here, please refer to British, French, Schilling, Dr. Lamb, and the U.S. Training sections. 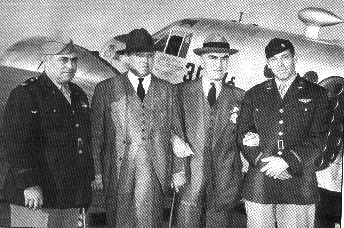 In the summer of 1940, Major Peacock of the United States Army Air Corps approached the Albany Chamber of Commerce about the possibility of locating a new Army Air Corps training facility in Albany. Albany's terrain, sparseness of population and weather made it ideal for the training of pilots. The Chamber investigated several sites, looking for proximity to rivers, railroads and utilities. The Army initially liked a site in Lee County and the city of Albany took out options to buy the land. Further investigation and deliberation by the Army, however, resulted in the choice of a site east of the Flint River in Dougherty County, four miles from Albany. The city canceled its options on the Lee County land and purchased options on the new site. The Industrial Committee of the Chamber consisting of John Davis, E.H. Kalmon, C.M Herrick, J.T. Phillips, W.B. Haley, A.C. Gortatowsky, C.Q. Wright and A.E. Runnels, began a drive to raise the money necessary to purchase the land for the base. The committee raised $50,000 by subscription - A mean sum for an area hard hit by the Depression and still reeling from the tornado that had devastated downtown Albany in February of that year. The city added a further $30,000. The land was purchased from the R.L. Jones estate and presented to the city by the Chamber and an additional 200 acres were bought by the city for $15,000. Further purchases of land were made in Lee County for four auxiliary fields. A total of 4,753,817.5 acres were purchased for the main base and other fields. The city leased the property to the United States government for $1 per year on lease with a 99 year option, renewable each year. The city also leased an office at 113 1/2 Pine Street from the Smith Lumber Company as a WAC enrollment center. Housing for WAC recruits was acquired at the Henry Binns Hotel at $1.50 per person per day. Hygiene stations for soldiers were leased in town at 226 Highland Avenue for black troops and at 2421/2 Broad Avenue for white troops Each station cost the government $25 per month. The Army contracted with the Holloway Construction for the building of the base. Civilian workers came from all over the South to work on the construction job. Local contractors were hired to fill smaller jobs such as erecting steel fences around the bases and building the base chapel. Construction under the supervision of the Army Engineers began on March 25, 1941. All water for the base was purchased from the Albany Water, Gas and Light Commission. Georgia Northern was engaged to build a railway spur to Turner Field at a cost of $20,475.